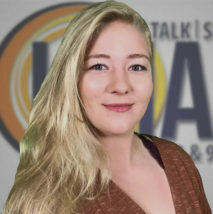 Mikayla has been with Manhattan Broadcasting since 2013, working as a reporter for KMAN while attending Kansas State University. While a student and journalist, she was also a soldier in the Kansas Army National Guard. Mikayla produced news stories and anchored for KMAN until earning her degree in the spring of 2017. After that, she left the company for a year to deploy as a broadcast specialist to the Middle Eastern theater of operations. She returned to her hometown to continue reporting for KMAN while attending graduate school at KSU. Mikayla is a passionate outdoors and fitness enthusiast, and advocates for animal rescue. She currently has two dogs, a former stray Siberian Husky mix and a German Shepherd Dog. She has spent hundreds of hours volunteering for an organization aiming to assist veterans pursuing higher education. She has lived in Manhattan for the past six years and is proud to call the Little Apple home, and call fellow Wildcats family.